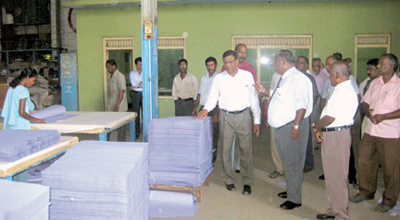 Once a thriving industry in the centre of the Eastern province, the Valaichchenai paper mill after years of slow operations and going through the restructuring program initiated by the State Resource Management and Enterprise Development Ministry, is now gearing to resume its full capacity to become a jewel of the Eastern province again. into profitable ventures and the paper mill in Valaichchenai is also progressing under the restructuring process. 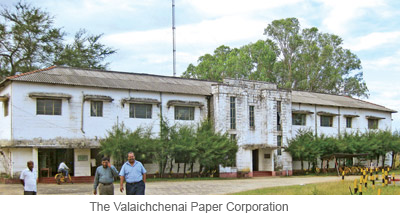 Valaichchenai Paper Mill commenced in 1957 and became state-owned in 1976 and was run as a State venture since then. It has a big reputation in the Eastern province especially in the Batticaloa district as it is the biggest factory in the district and people there are proud of it. According to the officials of the Valaichchenai Paper Mill it has become a real asset to the Eastern people as it was a place that created direct job opportunities for 3,200 in 1996 in which year they earned their highest profit margin enabling the workers to earn higher salaries and bonuses and incentives. However, the change of government policy with regard to the import of paper made the industry difficult for the Paper Corporation and the production level of the paper mill was reduced drastically in the latter part of the 1990s. The operations at the paper mill were disrupted due to the weak financial situation, lack of experienced staff, and also due to the escalation of violence in the Eastern Province. After the liberation of the East there were many attempts by the State to recommence the operations of the Valaichchenai paper mill but they were not successful as the operations were disrupted from time to time due to various reasons and it was almost on the brink of breathing its last from November last year to March this year. 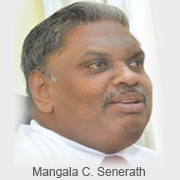 "It was in April this year that Valaichchenai paper mill was subjected to the restructuring program after Mangala C. Senerath was appointed as the Competent Authority. It is making steady progress since then", Gamage added. At the time of restructuring, the paper mill was producing only 50 metric tonnes of paper per month, which was not enough to pay the salaries of the workers and also the huge electricity bill amounting to Rs.2.5 million a month. The Treasury and the Ministry had to finance the paper mill to pay their salaries and other costs. "One of the major difficulties in making these institutes profitable ventures competing with other companies is that the state institution thinks only about the product coming from that institution. In the case of the Valaichchenai paper mill they think only about the papers. 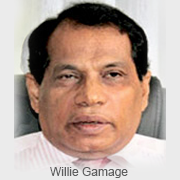 But if we think of its real assets, we can turn them into profitable ventures", Willie Gamage added. "So we thought of making use of the land available in the paper mill area for maize cultivation and earn the much needed income for the factory even if it cannot make profits from producing paper", he added. According to the Secretary 350 acres of land in the Valaichchenai paper mill premises will be utilised for this purpose.In the meantime, Valaichchenai paper mill premises has also become the source of water supply for the tourist hotels coming up in Pasikuda and steps will also be taken to supply those hotels a very good water supply. According to estimates the paper mill in Valaichchenai needs Rs. 2.5 million to pay electricity bills, Rs. 5.5 million to pay the salaries of the workers and another Rs. 5 million to purchase required used paper and other material needed for the factory. "Since May this year after its restructuring, the factory is earning its expenses without becoming a burden to the Treasury", he added.The Competent Authority of National Paper Company Limited, Mangala Senerath said he had to start the operations of the Valaichchenai paper mill with a lot of challenges ahead of him. "There were a lot of issues to be addressed and issues to be solved. We managed to settle all the burning issues there in the factory within the past few months to bring the paper mill to the present status", he added. According to Senerath the paper mill was producing only 42 metric tonnes of paper per month and that capacity was increased to 145 metric tonnes in the month of May and by July to 175 metric tonnes per month. "I am confident that the capacity of the factory can be increased to produce 500 metric tonnes of paper per month with the available resource and repairing the existing machineries", he added. He also noted that measures have been taken to provide facilities for the workers in the factory by providing them with resting places, canteens and their quarters within the past few months. But one of the major problems the company may face in the near future is the lack of waste paper needed to increase the production capacity. "Many government institutions which were used to supply waste paper to the paper mill have stopped supplying as the Paper Corporation had not paid the due amount for those institutions. After we commenced operations from April, we settled all dues for the institutions supplying paper to us within one month", he added. "We had a stock of 800 metric tonnes of waste paper to be used for paper production. With the increase of the production capacity this has reduced to 200 metric tonnes at present. If we don't get enough supply of the waste paper we may not be able to achieve our targets", he added. National Paper Company Limited has started to streamline the collection of waste paper needed for the production of paper from the government institutions offering Rs. 6 per kilogram of waste paper and Rs.8 per kilogram of cardboard. "We are facing this situation due to as much as 8,000 metric tonnes of waste paper are being exported to India and we are getting a lesser number of waste paper for our production", he added. "Therefore, we request the government institutions to provide us the waste paper, collected at their institutions, enabling us to increase our production capacity", he added. "We are ready to pass the break even point of the factory by producing the 350 metric tonnes of papers per month and provide the required paper material for the government institutions", he added. "Apart from that we are also expecting to establish sales outlets in major cities in the country to increase the sales", he added. "If we get better machineries and equipment we can go for better products competing with other paper products in the country and we will be able to provide more job opportunities for the people in the Eastern province in the future", he added.